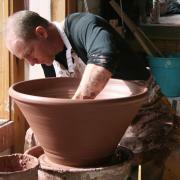 Scott Garrard is Professor of Ceramics in the Visual Arts Department at GRCC. He has been an active teacher, ceramic artist, and small business owner since 1982 and has been employed at GRCC since 2010. Scott has participated in ArtPrize since 2011 and this year compiled a short time-lapse video of the construction of his entry, Teapot 48, which is a large 2×4 wood construction and follows the theme of teapot sculptures he has presented in the previous two years. Teapot 48 was exhibited during ArtPrize at the Cathedral Square venue.